A few weeks ago, I wrote about redundancy in the cloud, mainly using AWS (Amazon Web Services) as an example. Today, we’ll talk about how to connect multiple regions together through a VPN so that systems can synchronize local IP address to local IP address. Some systems will allow you to send backups and perform a restore over the Internet to public IP addresses, but in the event, you are using one that doesn’t, a VPN will be required. Connecting different regions together is important because sometimes entire regions on a cloud platform can suffer from catastrophic failures as recent events will prove. Placing all of your eggs in one basket, as they say, is a bad idea. Unfortunately, when it comes to AWS, there is no mechanism to route traffic to a geographically separated region over AWS alone. I have no idea why, but that’s just the rules the AWS gods have directed us to follow. So, to fix that, we need to create a VPN. Fortunately, there all sorts of canned VPN solutions. The downside is: they generally cost quite a bit of money. You’ll find that you will need to pay a subscription fee on top of AWS usage charges for a Palo Alto, Brocade, or Fortinet virtual appliance. While these are great to have, they might be cost or operationally prohibitive for your environment. Thankfully, there is another solution, and it’s called OpenSwan. OpenSwan is a quick and easy way to turn a Linux machine into a VPN server using IPSec. The major benefits are that it’s free to use and install, and it can run on a cheap instance on AWS (free tier). Meaning, you’ll essentially just pay for storage, which can be small at 8 Gigs per machine. You’ll, of course, need two of these Linux instances, one per region. 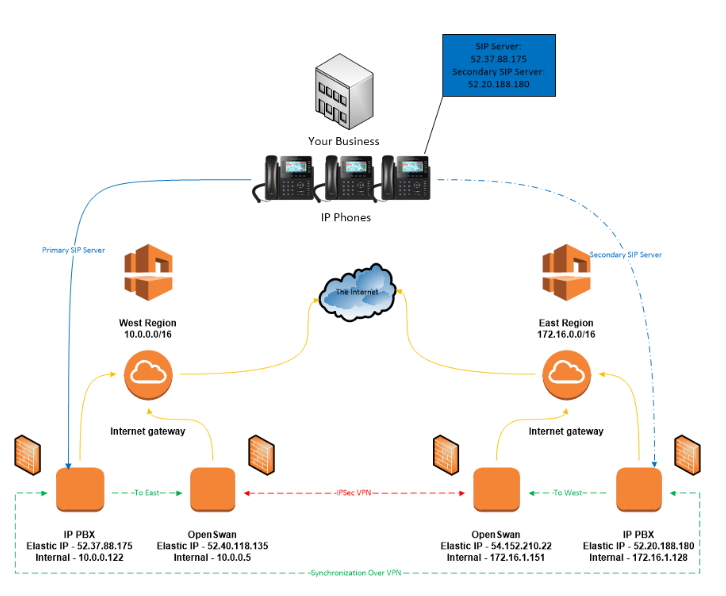 Let’s create a hypothetical scenario, configure a VPN between two AWS regions, and route traffic appropriately. Let’s build our VPN (IPSec with PSK). Somme AWS and Linux experience required. 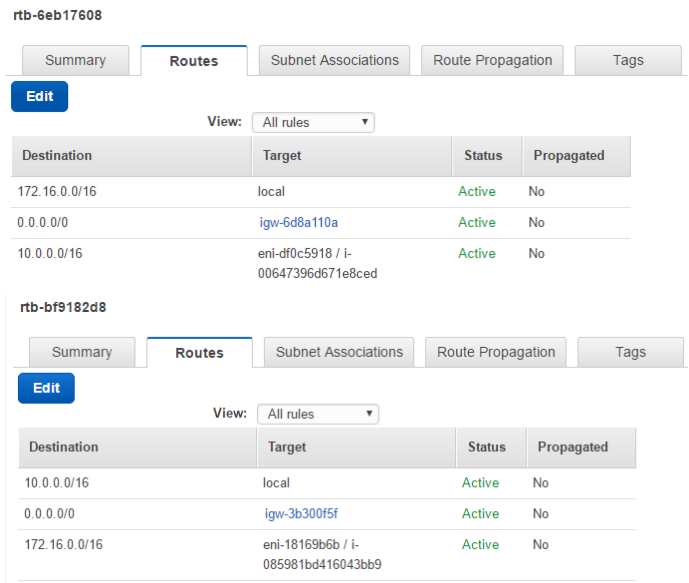 Launch two new instances of Amazon Linux in the FreeTier (t2.micro). The VPN is meant for synchronization only, so it doesn’t need a lot of horsepower or network performance. 2. 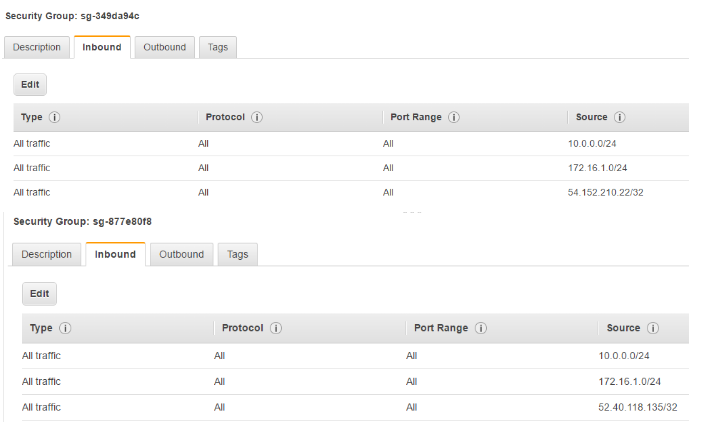 Attach Elastic IP addresses to your instances. 3. Route traffic for the opposite region to your new instances. 5. Log into your instance update, and install OpenSwan on each. 8. Create the configuration for the West region OpenSwan instance. 9. Create a .secrets file for the West region OpenSwan instance. 10. Do the same on the East OpenSwan instance. 11. Restart the network service on each server and start the VPN. 12. Check your VPN status. If all went well, you now have the ability to synchronize or replicate your IP PBX configuration. I’d like to add and make clear that the scenario and configuration above should strictly be considered a proof of concept and shouldn’t be used for production. If you are thinking of employing a similar setup, make sure you are more specific with your security groups (mostly with allow protocols, and outbound connections). You should also consider narrowing your subnets to something significantly smaller if you won’t be needing so many IP addresses. There are also several ways to configure OpenSwan. I chose PSK in this example because it is the most simple to configure, but check out the OpenSwan wiki for more options. Thanks for reading and Happy VoIPing!